Eurowood different engineered timber log profiles, different laminated timbers. The launch of New Zealand’s new solid wood, interlocking timber building construction firm EuroWood Construction’s information and promotional website and news blog in December 2014 was a combined brand launch and website design project. It has been well received by the client and their market. The project was a collaboration between MagentaDot Brands, Identity Signs, and the client who content managed/populated the site. The process of building a great brand and a great website begins with defining the marketing communications problem, the audience, the market and studying the competition in order to first define the business “problem” that the branding, visual and marketing communications material is intended to solve. Also known as the creative brief, it forms the foundation of the methodology that delivers brands that have longevity and value and websites that effectively connect customers with our client’s brands. Euro-Wood branded vehicle wrap. Front threequarter view. Product item or catalogue item page. The first step towards portraying the reality of a client’s business is to describe it. I ask: What is the business, really, what are their goals? Talking about this and listening to the client helps guide my design in the right direction and not stray from the path. The creative brief is a conceptual toolkit succinctly framed with the four questions; Who? What? What? Why? That helps reaching an agreed goal with the client as quickly as possible. Muda box board in 900gsm is too thick to be printed on a rotary press. This means the graphic elements need to be applied to the flat worksheet by means of screenprinting and foil stamping and other bespoke tools from the print finishing toolbox. Web design often involves an effort to resolve the difference between what the client/stakeholders want and what the end user wants. Typically the client has a list of “must-haves”, but each user that comes to the EuroWood site will typically want just one thing. There are conventions of web design, such as putting lots of graphic elements and text on a page, that users are accustomed to now, but beyond a certain point they don’t help a page make a good first impression. Instead they distract from the user experience being one where they find the page attractive in useful ways. Designers are best to acknowledge these conventions, not doing so is risky for both the client’s business and theirs. Web design is a relatively new discipline but it does not exist in a vacuum, or without historical precedent, it is connected to print and advertising and the world away from the screen. Things learned from other kinds of design, such as sign graphics, advertising and publication design are useful. Users know that when they see it. Web design has a critical role to play in ensuring the EuroWood site will rise to the critical part it has to play in the firm’s marketing mix. The EuroWood brand, product and sales propositions will appear “above the fold”, most of the important information and navigation items need to appear in the top half of the homepage. Minimalist design relies heavily on the effective use of deliberately constructed white space to organise information and create an easily understood, attractive visual heirarchy of information. Creating re-usable or modular custom design assets that fit within the established grid and get reused throughout the site. The modular approach helps create design efficiencies and also aids user-friendliness by repeating recognisable graphic elements that site users become familiar with. Arcadian colours are the hues of trees, grass, wood, water and sky. 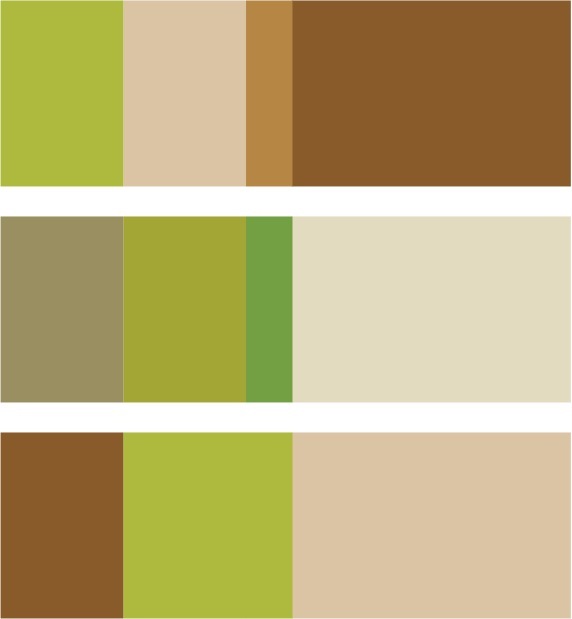 On your website as in your home use these colours to create a soothing environment with a scandinavian modern clean and relaxing appeal. Conscious and thoughtful colour selection for web design is often overlooked if not completely ignored. Selecting colours based on personal preference or simply out of habit is far from the optimal approach. Every colour and combination of colours has a distinct set of meanings and associations. These meanings can be put to use in useful ways that serve the strategy and purpose of the design. Even when controlled by client specifications there is great power in the way the site colour scheme is used. The colour green is soothing, safe and very refreshing, green has a primary association with nature and the environment, and of course trees—but green is also associated with the idea of “proceeding”. Responsive websites use responsive design technology so they look great on every screen portal, the adaptive technology built into the EuroWood site code future-proofs the site, ensuring its longevity. The design style of the site is an effort to connect with the EuroWood site user’s sensibilities and their need to be able to relate to things on our site by way of their prior experiences on other sites. Coordinated with the publishing of the site is the establishment of a EuroWood Google+ business identity and linked YouTube channel which are all link back to the company website. This clicks and mortar business presence was further augmented by the creation of a business Facebook page. 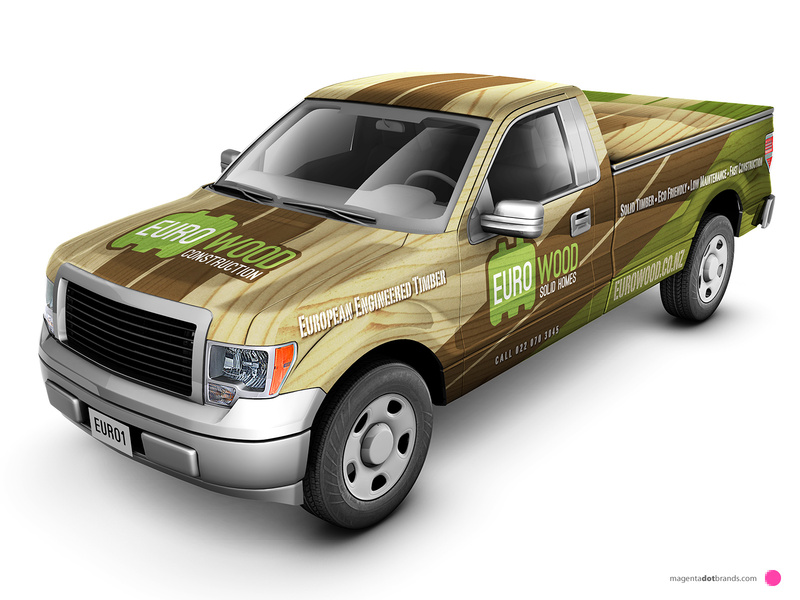 Euro-Wood branded Ford pickup vehicle wrap. Vehicle wraps are a form of Urban Graphics. The best graphic look of the brand applied to a vehicle transforms it into a moving billboard—the aim is to infiltrate the landscape with a supergraphic that attains both a highly visible effect and forms a coherent relationship with the rest of the brand and identity system.